Home > Resources > Transfer > How to Transfer Data from Nokia to Android? Just received your new Android phone but get frustrated because you have no idea to transfer files from your old Nokia phone, which you have used for several years, to the new Android phone. 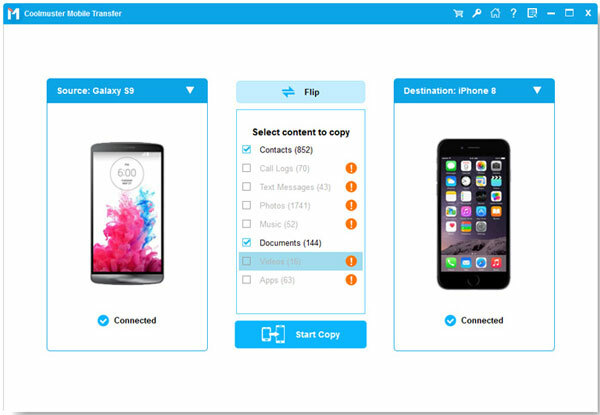 You just wonder if there is a tool allowing us to share everything like contacts, text messages, photos, videos, apps, songs, etc., between two phones, so that you do not need to spend much time to copy these files one by one manually. This Nokia to Android data transfer tool is compatible with all Nokia and Android phone models, and can be used on both Windows and Mac platforms. You can accomplish the data transfer from Nokia to Android by following the steps below. 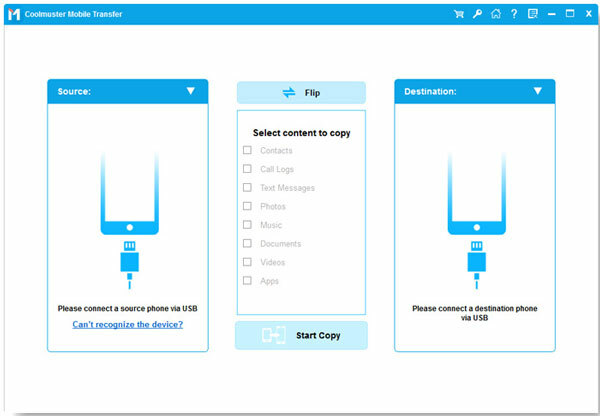 To get started, install and launch the program - Coolmuster Mobile Transfer on your computer. The primary window is displayed as follows. Connect your Nokia and Android phones with your computer via USB cables at the same time..
Click "Phone to Phone Transfer" -> "Start" on the primary window to export files from Nokia to Android. Then, the program will detect both of your connected device and show them side by side. Preview the contents and only check your wanted ones. Then, click the left or right arrow in the middle to begin the data transfer process. In the pop-up dialog, you can check the transfer process.